“Why start a blog?” is the question that thousands of people ask themselves every month. According to Google Keyword Planner tool, between 100 and 1000 people are looking for the exact phrase “why start a blog“, every month. There are also other close related search terms, such as: “why to start a blog,” “why should I start a blog,” “should you start a blog,” “why do you blog,” “why to blog,” “why blog”, and so on. And those are only the search queries in English, but people from all over the world are looking for the benefits of starting a blog. We see more and more cases of bloggers who have become millionaires and more people realize every day that blogging is not anymore only a way of sharing your personal experiences with your friends an family. A blog has become an essential marketing tool for companies and also a route that allows individuals to start an online business without a huge budget. How about the quality of the traffic? While it’s impossible to determine the real number of blogs worldwide, according to Statista.com, in 2017, there were over 373 million blogs created only on Tumblr, with 73 millions more than in 2016. And Tumblr is not the only blogging platform. There is also WordPress.com, the self-hosted version of WordPress, Blogger.com and thousands of other blogging scripts and blogs built with other popular CMS, such as Joomla and Drupal, but also with custom designed scripts. WordPress is, the blogging platform preferred by the most bloggers, because it’s is free, easy to use, SEO friendly, easily extendable with plugins, and because it’s continuously developed and improved by its huge community. Forbes states that WordPress is used by over 75 million websites in 2017. And these numbers are growing rapidly every year. So, starting a blog is a great way to advertise your services and to make money as an individual, but do you know that there are other countless benefits for starting a blog? If you’ve read my story, you already know that I’ve tried to make a living online for a few years. I jumped from a business opportunity to another, from a shiny object to a new bright object, from a “make money online method” to another “new make money online method” and so on. As a newbie, the only thing that got me the best results was blogging. The period when I had a blog and when I wrote blog posts consistently, was definitely my best time in terms of results. Now, after analyzing my past mistakes, I started blogging again. This time, I want blogging to be my primary focus in the years to come. Below are the primary reasons that have determined me to start blogging again. Hopefully, these will also reply to your question on “why start a blog” and help you to see the benefits of having a blog more clearly. While every person might have a different reason for starting a blog, I’m going to share with you what are my primary reasons that have determined me to start a blog and what I think to be the primary benefits of owning a blog in the long-term. If you want to have a real business online, you need to build reusable assets. Just like an email list, a blog is something you own. You control the appearance of your blog, the content, what you promote on your blog, etc. If you create high-quality content, people will follow you and will re-visit your blog on a regular basis. While there are multiple types of assets you can and should build, in my opinion, a blog should be in the center. Imagine you managed to build an extensive email list, a large number of followers on the social networks or a large number of YouTube subscribers. But what if one day your accounts get blocked because YouTube, Facebook, Twitter, or the company behind your email autoresponder has suddenly changed the terms and conditions and your account all of a sudden doesn’t comply anymore with their terms and gets shut down. That happens all the time and if you don’t believe me, just try a Google search and read the horror stories that show up for terms like: “Youtube account shut down“, “Aweber account suspended“, “Twitter account suspended“, etc. I read cases when people lost their huge email list because their email autoresponder company has changed its terms and have become “not so marketer-friendly”. A large email list is something usually built in years or with a good amount of money spent on paid traffic. 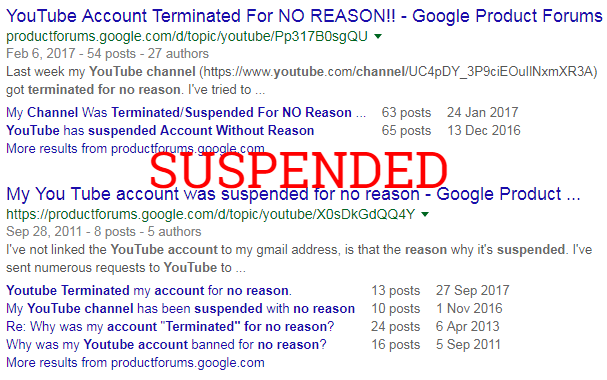 A similar scenario also happened after Google Adwords has changed their terms a few years ago and a lot of people who were depending on this traffic source for their business, were forced to stop their advertising campaigns since their ads were not complying anymore with Google Adwords’ terms and conditions. Facebook Ads also seems to be following a similar path since their advertising rules became stricter concerning at the type of products and niches that can be advertised using their ad platform. The point is that when you depend on external companies, you have no control over your assets and you can never be cautious enough. I know it sounds like a “worst case scenario,” but as I already said, I know people who were relying heavily on a single company and they have lost most or their entire business and income due to some factors they had no control over. If your business is going to depend on in a significant percentage on a single platform, company or service, you can get easily get burnt without a prior notice. While you have no control over the services and products of external companies, you are in the full control over your domain name and your blog. Once you have a blog, it should become your virtual home, the place where everybody will know where to find you regardless if you still have your YouTube account, your Facebook page or your email list. There are no doubts that a lot of people have succeeded in this industry without having a blog, but I think a blog is a big plus and an asset that can bring you a lot of benefits. There are more reasons why to start a blog than reasons for why not to start a blog. While there are people who start a blog by passion, the reason why many people start a blog is the financial benefit. The second category of persons is usually more prone to fail because they are expecting to get fast results with a minimal level of work and in a short time. I can integrate into both of these categories. While I started my blog with the making money online idea in my mind, blogging it’s also something I’m enjoying doing. Even though I’m very aware and excited about the fact that a blog can earn me enough money online, I also like to help other people by sharing with them the knowledge I’ve accumulated in this field since I first started. If you intend to start a blog to make money online, just like me and as many others, I recommend you to create your blog around a topic that you enjoy and know to write about. I’ve tried to create blogs in a few niches that I didn’t know anything about. I ended up finding myself that I had to write about things for which I had no interest. I had absolutely no enthusiasm to write about those topics and writing a single post was a pain. As you can expect, I had no success with those sites whatsoever, and I had to abandon them after some continuous struggles. However, let’s assume you’ve started a new blog in a niche you are enjoying writing about, but can you make money blogging? The answer is yes, and the earning potential is limitless. According to an article posted by Forbes, these are the top ten blogs that generate the highest revenue in 2017. In the original article, it is stated that “these figures are estimated numbers based on traffic and other publicly-available statistics”. However, I assume the real numbers should be pretty close to the truth. I know that these are well-known blogs, owned by big companies, but even so, I consider these earnings to be extremely impressive. Some of these were just started by individuals like me and you, had an exponential growth over the course of the years and then sold the companies who currently own them. There are plenty of ways to monetize a blog. From offering consulting services to displaying ads from various ad networks, promoting products as an affiliate, selling ad space, selling your product, creating membership sites, etc. But blogs aren’t only for individuals. If you are a company, a blog is still one of the best ways of attracting new clients. Offering a bit of your expertise upfront by helping your blog readers, will attract new paying customers. I consider blogging to be one essential and a very efficient tool for inbound marketing. With an excellent blog you don’t have to chase new customers; usually, customers will chase you. Starting a blog is cheaper than starting any other business. If you want only to see if blogging is for you, you can even start a blog entirely for free. You can start with a free blogging platform such as wordpress.com, blogger.com or tumblr.com. Of course, a free blog comes with limitations. You will have a URL like myblog.wordpress.com or myblog.blogger.com, you cannot add what themes and plugins you want, you don’t have the control of your blog’s database, etc. I only recommend you start a blog on a free platform if you are either a complete beginner or if you don’t have any money. However, since there are some obvious disadvantages in having a blog on a free platform, I strongly recommend you to get a domain name and a paid web hosting package. You can start a blog with less than 30 dollars, and you will have the full control over your blog and content. Read my post on how to choose your blogging platform for more info about this topic. What I most love at having a blog is the free traffic received from the search engines. Once your domain advances in age, and once your content gets some high-quality backlinks, your blog will start showing up in the search results for more keywords and should start receiving traffic from the search engines on a daily basis. 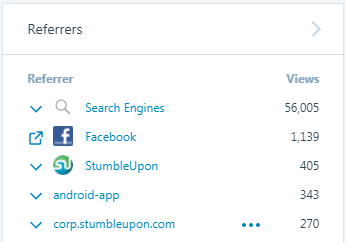 I think the free traffic alone is undoubtedly a good reason why start a blog. Besides the fact that it’s free, this traffic is also highly targeted and converts exceptionally well if you optimize your blog posts for the right search keywords. Do you think that someone who types in Google “buy best golf clubs” and reaches your page about “10 Best Golf Clubs to Buy This Year“, has a buying intent? That’s clearly a person interested in buying “golf clubs”. And how much did you pay to get that sale? Absolutely nothing, just the time for creating the content and for optimizing the content for the search engines. Of course, that was just an example. It’s not easy to rank for “buy ___” keywords, but there are also a lot of other keywords with buying intent that it’s easier to rank for. It also depends on the niche of your site and the overall level of competition. 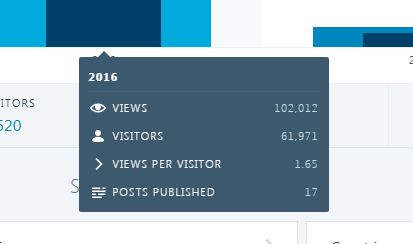 Let me show you a screenshot from my old blog and the traffic received since I started the blog. This traffic was tracked with the JetPack WordPress plugin. I need to mention that I was only adding new content occasionally and sometimes even months have passed without adding a single post. Therefore, I can say that my blog was far from being a large blog, but I still made money with it. As you can see, the whole year, 28.520 different persons have visited my website and they have seen my website’s pages for 49.130 times. That’s only with 17 posts published the whole year. Since this was the second year of the blog, the traffic volume has doubled. The blog has been viewed by 61.971 of unique visitors, with a total number of page views of 102.012. Not bad for the effort of writing 17 posts, right? While 2017 has not ended yet, it was the year when I’ve completely abandoned the blog. 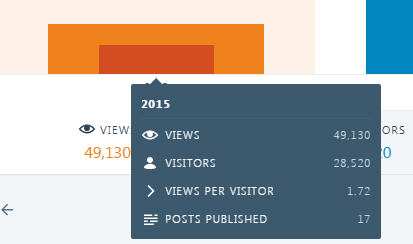 As you can see, this was the year when I haven’t added any new posts. This was also the year when I have removed a few of my top performing posts and the year when the blog was offline for a long period of time. 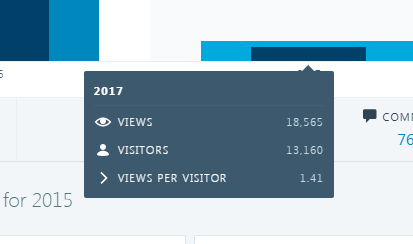 Yet, the blog has received 13.160 unique visitors, which have seen site’s pages for 18.565 times. Can you see now why I refer to a blog as an endless source of free traffic? As you can see, for the year 2016, the majority of the traffic came from The United States and there are 3 tier 1 countries (United States, United Kingdom, and Canada) in the top 10. Tier 1 traffic is considered to be the traffic of the highest quality, with people from the English speaking countries and the countries with the highest spending power. Where were most of the visitors coming from? As you can see, the vast majority of the visitors found my blog using the search engines. It’s not a ton of traffic if we judge the volume, but even so, it is free traffic. I don’t even want to think how much I would have to pay for that kind of traffic. Is true that for getting your website ranked at the top of the search engines results, besides of adding content regularly, you also need to do a bit of search engine optimization work. However, once your blog starts getting a bit of authority, your traffic will begin to come consistently, and you should receive free traffic years after years. In the long-run, that will definitely worth your time. In any online business, it is vital to brand yourself or your company. You can choose to build a personal brand around you if you want to be known as a “go-to person,” or you can choose to make a strong brand around your company’s name. How will a blog help you to brand yourself? By blogging, you always need to create new valuable content for your readers. When people find your content helpful, they will start to see you as an authority in your niche, and they will return to your blog for reading more of your posts. When your blog’s readers consistently see your name, photos, your company’s logo or name, some people will eventually become very familiar with you even if they’ve never talked to you directly. Most of the times, these are the people that will follow you in every business you promote, purchase the products you advertise and so on. People join people and not opportunities. Regardless if you are in the network marketing business or not, I think it is very important to brand yourself and to build a strong relationship with your followers. A blog is definitely one of the best tools for achieving that task. One of my biggest struggles when I first started a blog was the language barrier. I’m by no means a good writer, but I’m sure that my writing has been improved a lot since I started my first blog. I was born in Romania, and I still live there, so my primary language and the language I speak on a daily basis is the Romanian language. Because the Romanian language is a Latin-derived language, it’s more related to Spanish, French, Italian, and Portuguese than English. While English is the second language for many people in my country, it’s still not very easy to write my posts in English if I don’t actively speak the language. And still, despite this fact, no one of my readers has ever complained about this. If you deliver free and real value in your articles, people will not complain about a few mistakes (of course, unless your English is extremely bad and your posts have no meaning). There are also available tools that you can use to proofread your posts and improve your writing. One of the tools I use since I started blogging is Google Translate. Google Translate helps me when I don’t find the right words, or to find synonyms. 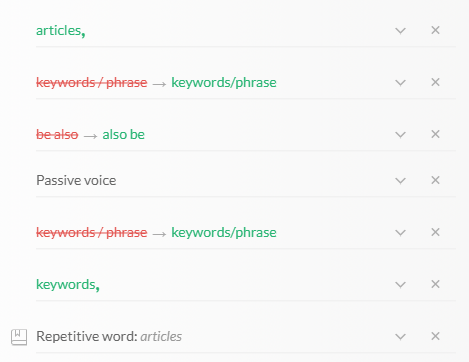 Another tool I use to improve my writing is Grammarly. While Grammarly has a free version, it’s the second year I have a premium subscription for Grammarly, and I don’t know what I’d do without it. Grammarly helps me a lot in proofreading my posts, quickly finding synonyms or rephrasing certain phrases that don’t sound good. See a glimpse below. The premium version also has a few additional features than the free version, but I found even the free version to be very useful. Keep in mind that you can also start a blog in your primary language. It’s not required that everyone starts a blog in English. 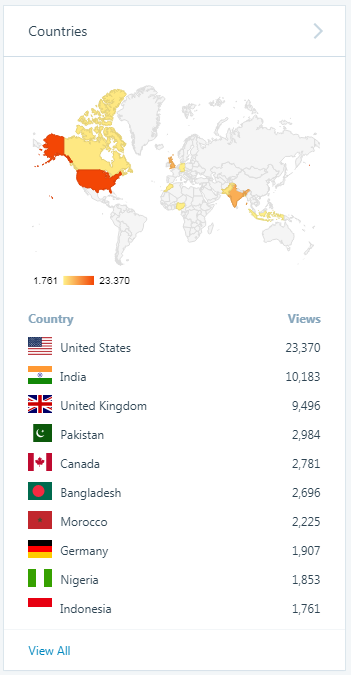 The main reason why I started my blog in English and not in my native language is that the subjects I cover in my blog posts don’t have a big demand locally yet. Having a blog in an international language is definitely a big plus for the potential audience and people interested in your niche. However, having a blog in English means also more competition concerning SEO. There is a significantly higher number of sites that you’d have to compete within an international market than the number of websites that you’d have to outrank if you’d target your local market. One of the best advice I can give you if you are facing the same issue is to not let the language barrier be a significant obstacle when it comes to starting a blog. Your writing will improve over time with a lot of practice. If you write content good enough, a part of your blog’s visitors will revisit your blog. If you can convince a percent of them to subscribe to your newsletter, then you’ve hit the jackpot because you can then just send them an email and they will be back on your site. Unlike the email lists built by buying solo ads, or worse, by buying leads, an email list created from the traffic of your blog will be much more responsive. Your spam complaints to the autoresponder provider will be fewer, and therefore, the risk of having your autoresponder account suspended is way reduced. Besides that, solo ads have become very expensive. I’ve purchased a few solo ads in the past, and the price of a decent solo ad is usually over $0.50 per click. Only a very low percentage of the clicks received from solo ads will turn into sales. Most solo ads sellers will segment their email lists into buyers and freebies seekers and guess from which list your traffic will come from? If you said from “freebies seekers lists,” then you are right. The solo ad sellers are sending clicks from the people who never purchased anything from them and you are expecting to make money with that traffic. A blog with a decent traffic can help you grow a super-targeted and responsive email list at no costs. Personally, I think this opportunity itself is a strong reason why to start a blog. Most of the people who will reach your blog will be looking for answers to their problems. If they find a solution in your blog posts, they will interact with you either by leaving a thank you comment, they will follow you on the social networks, send you a friend request, subscribe to your YouTube channel, or even send you an email via the contact form on your contact me page (assuming you have one). You are also going to meet people who activate in the same field like you. They might have a similar blog, or they will be looking for Joint Ventures partners. If you are really good at what you are doing, people will also contact you for consulting services (depending on your niche) or hire you. Anyway, a blog is undoubtedly the perfect way of connecting with like-minded people and improving your contact lists. A blog is a good way to show off your projects, skills, experience, and ideas. I’ve heard of cases when blog owners have been contacted by big companies who were looking to hire them for high-paying positions. If you offer any type of services, a blog is one of the best places where you can show your knowledge in a field. In fact, a blog can be more powerful than a CV, because you can literally prove that you know your stuff. While it’s not very productive to start a blog having in mind to sell it later, it’s something you can take into consideration after some time. How would you like making money while you are blogging and making a nice amount of money before your retirement? I know it sounds perfect, but having a blog gives you this possibility. There are a lot of people who’ve sold their blogs for exorbitant amounts of money after years of writing content for their blogs. To make a better idea on the prices a blog can be sold for, you can take a look on specialized site selling marketplaces like Flippa. Of course, you should first find the genuine blogs, since most of the sites sold on Flippa have non-unique, junk content, or content generated from spinning another site’s content. An authoritative blog with high-quality content and in a good niche will always be sold for a big sum of money. If you’re starting your blog with the intention of selling it in mind, I wouldn’t advise you to make its content very personal. I also do not recommend you to get a domain name around your name since it will lower a lot the value of your blog in the case you want to sell it. Instead, go for more general names that describe your niche, or a name that can easily be branded. Everyone who wants to have an online presence needs a blog. Regardless if you are an individual or the administrator of a company, you should be blogging. A blog is your virtual home, the place where people will find you when they need your expertise, services or an advice. As a company, through blogging, you will gain authority and become more trustworthy in people’s eyes. That this will inevitably lead to getting more customers for your products and services. A blog is so important because you have the full control over your domain name and content, while when you rely on external sites for building your web presence (Facebook pages, YouTube channels, Google Plus profiles, etc. ), you have no control over your assets and you can quickly have your accounts suspended. Blogging is also a good way of earning money without having to spend too much money. Many bloggers are living from the money they make with their blogs. If you get tired of blogging at one point, you can always sell your blog. Writing content on a regular basis will improve your writing and communication skills. That will open you new possibilities and opportunities, like becoming a ghostwriter, a freelancer, copywriter and so on. Having a blog will open you new doors and opportunities. As a blog owner, you can make new connections in your niche, find new Joint venture partners and friends. Now that you know why to start a blog, you can start learning how to choose a niche.